For a Cycle Count, you need to know what Category(s) you are scanning and where they are located. Typically, you should not need to section off the store during Cycle Counts. For a full-store inventory, at this point, you should already have the store sectioned off with your section numbers and blue painter's tape, and have filled out your Section Status Checklist so you and your team know where the sections are. It's important that each section is scanned in it's own file. Before scanning a section, initial the Section status Checklist in the Scanner Name column for the correct section row. This lets everyone else know that particular section has already been claimed. 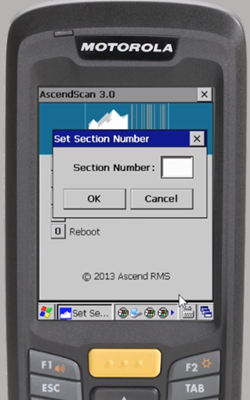 Then select 1 for scan inventory on the scanner and enter the Section Number into the scanner. Select OK and head to the section to start scanning! Just press the yellow button to scan an item. 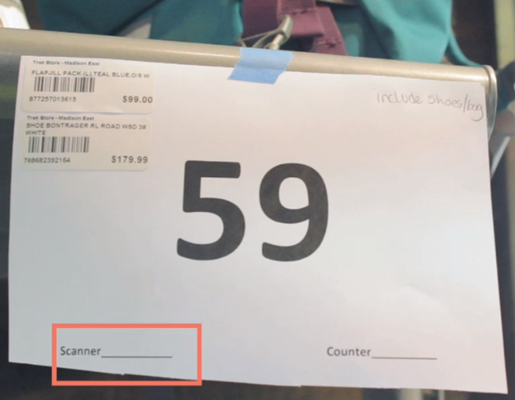 Make sure to scan every single item in your section. If you have a lot of items in a row (or on a hook), you still need to scan every individual item. Do not assume they are all the same size or color. If you encounter any bad beeps, check the item for a second barcode and try scanning that one. If you are not able to scan the item, take it out of the section and bring it to your team's "mystery box." After scanning the section, initial the Scanner line on the section number sheet. You might notice the count number on the scanner seems to be "one short" - it's not! The scanner has the final item information currently on the screen, and will add it to the file. 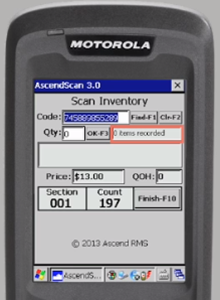 Now bring the scanner back to your inventory point person so they can collect the file information. 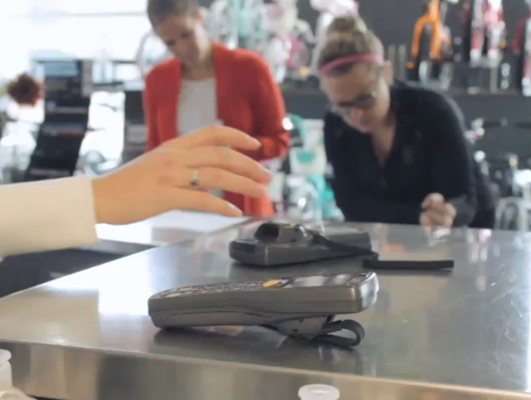 We recommend placing scanners with new section information on them facedown on the counter. Once the inventory point person has obtained the file and cleared the scanner for use again, they'll lay them down face-up for your team members to grab. 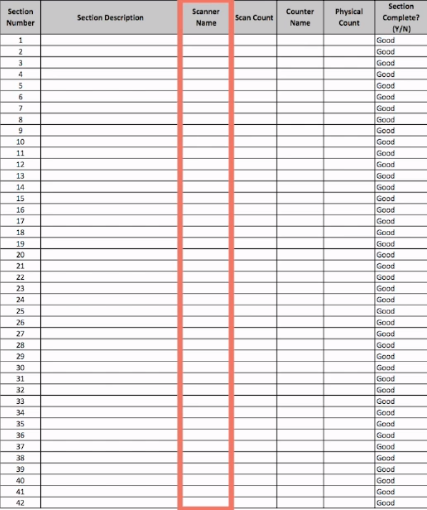 Do not write down the count number on the Section status checklist. This is the point peron's job once they load the file onto the computer. Then, if available, grab a new scanner and start scanning another section! 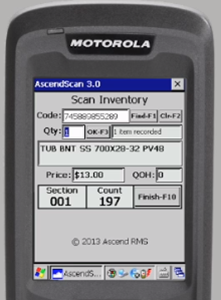 Give your service team and service area priority for scanners, and have them start right away i the morning. There are a lot of little pieces in the service area, so this area tends to take the longest! Uh oh! Did you just double-scan an item? Don't worry, you can fix it easily. If the very last item you scanned was a mistake, it's information is still on the screen and it hasn't technically been added to your count yet. Hit the 0 (zero) button on the scanner. Then hit Enter. The scanner should now show 0 [zero] items recorded and you can continue scanning the section. What if I mess up a section? It's not a big deal - and we'd rather you were honest about it now! Just bring your scanner back to the point person so they can reset it, and you can start fresh on that section. After a section has been scanned, it's time for the physical count. It's important to save the physical count until after the scan count, in case of bad beeps. Once the scanner is done and the "bad beep" items have been moved to the "mystery box," it's time for a physical count. Initial the Counter Name column on the Section status checklist and then head to that section where you are physically counting every single item in that section. Then, also initial the Counter line on the section number sheet and go back to the Section status checklist to add the count number to the Physical count column. Start by reviewing the Section status checklist and highlighting on your designated color (such as green) the lines where the scan count and physical count match. Any lines where they do not match should be highlighted in your designated caution color (such as yellow). Check where the section is and decide if it needs a recount. A large/low-cost section, like Nutrition, might be okay with if the count is off by two. But that'd be a problem with Bikes! What if the scan count and physical count don't match? If you have caution lines that need to be addressed, it's time for re-counts. Since physical counts are usually faster than scanning, send someone back to do a physical re-count of that section. It can be the person who originally counted the section. If the number they come up with matches the scan count, the first physical count was probably off. If the number they come up with matches the first physical count, you need to send someone to re-scan the section. If the re-scan matches the number for the second physical count, delete the original scan file from the Inventory Files folder and add this new one. If the numbers still don't match, send your scanner and counter out together to go through the section. If they still can't resolve the issue, send someone new out to help.